Boglárka Csemer "Boggie" was born 30 November 1986 in Budapest. Boggie began her musical studies at the age of 13. Two years later, she has started classic singing and piano at the Music School Fasang Árpád Zeneiskola. This was till 2007, whilst from 2004 she also studies at the Ferenc Erkel Elementary Art School and Jazz Music High School. In 2005 and 2006 she spent a year in Paris, where she came closer to the French language and culture and between 2006 and 2007 she has acquired qualification as French-speaking tour guide. In 2007 in started to study in Kőbányai Music Studio of faculty and in parallel in the Charles Esterhazy College, with specialization in French romanistics. In March 2009 Boggie has founded "Csemer Boglárka Quartet". In 2011 she takes part in "Csillag Születik" (A Star Is Born) - Hungarian version of Got Talent on RTL Klub together with pianist Áron Sebestyén. Being eliminated in the semifinal round, she still gained many fans. Their song "Japánkert" won the Special Prize of the Hungarian Jazz Association. In 2012 Quartet performed at the Palace of Arts on the Jazz Showcase. In 2012 and in 2013 she serves as jury member at the National chanson competition. In 2014 she also sings in French band Accordzeam. In 2012 Boglárka started working on her first record. Instead of previously used CSBQ (Csemer Boglárka Quartet) the band starts performing under short name of lead singer Boggie. Besides Boglárka herself members of the band are Áron Sebestyén – keys, Mihály Simkó-Várnagy – electric cello, bass, Tamás Szabó – drums. Her self-titled album is released in 2013 by Tom-Tom Records. It includes songs in Hungarian, French, and English, half of them written by Boggie herself. Album reaches fourth place on Mahasz chart. "My music is a mixture of all the styles I learnt: pop, jazz, French chanson, country, folk and classical. It is something that I call high-quality pop. I think it is really important to start to compose your own songs because it defines your character and it helps you to find your own voice. There will come a time when you will see that it was worth it. My full name is Boglárka which has no equivalent in any other language. That's why I decided to use my nickname as an artist name: BOGGIE"
In January 2014 Boggie's music video to "Nouveau Parfum" (French version of Hungarian "Parfüm", that was submitted to "A Dal" 2012 but was not chosen to compete in the show) was picked up by media outlets in various countries, including German RTL, Good Morning America, French edition of ELLE, Daily Mail, Time and Cosmopolitan. The video and its message are similar to the Body Evolution viral video created for GlobalDemocracy.com to encourage the introduction of mandatory disclaimers on retouched images in popular media. The video has been viewed by more than 30 million people all around the world and her debut album skyrocketed to the 3rd place of the Billboard jazz list and to the 17th place of the Billboard world music list. Following the success of the song, Boggie gave more than 100 live concerts in 2014. She has also played at the Jazz Sur Seine festival in Paris and at several shows in New York, Frankfurt, Munich, the Netherlands. On 24 October 2014 Boggie releases her second album "All Is One Is All", which also includes her Eurovision entry "Wars for Nothing". 2015 started as a lucky year for Boggie: she was nominated as Glamour Woman of the Year, her videoclip for her single Nouveau Parfum got among the 17 nominees for the Highlights of Hungary awards. "When we were recoring the album with Áron Sebestyén, I wanted to perform a beautiful ballad. I was touched by the situation in Ukraine and it depressed me. I wanted to write a song about it, and about all the wars for nothing all over the world. By the time I went to Áron, he had already written a song about this topic for me. I quite often think about the things of the world, bad things easily stir me up. Everywhere in the world there are wars, but Ukraine is so close to Hungary and I actually have relatives there, so I thought "This could happen with us. How can we solve this?" I've read newspapers and tried to follow the news from Ukraine. And then I ran into a Ukrainian refugee in our elevator and it was shocking for me. If a war takes place near to you it has a bigger effect on your feelings. However, the song itself is not just about the war in Ukraine, but rather speaks more generally about discrimination, oppression and war. I really wanted to sing about this message to everyone"
Our next guest at the ESCKAZ interviews section is representative of Hungary Boglárka Csemer - "Boggie", who brings to the Eurovision Song Contest not only a song, but the message. As usual, we've started with question what Eurovision Song Contest participation means to the artist? "I'm so happy and I feel so blessed. I'm so proud of this result. I'm really excited about Vienna! :-) Eurovision is the perfect stage for my music to reach more people. I really appreciate the idea of Eurovision. I think it's a great opportunity for different cultures, different nations to meet and get to know each other's culture better"
"Actually my song was written for my second album "All is One is All", which was just released in October 2014, not for the Song Contest. We picked "Wars for Nothing" from among our other songs. I wanted to be represented with an English song and a song with an important message. It was created by three composers: Áron Sebestyén, Sára Helene Bori and myself. We have different background stories. I, personally, can be easily touched by any human's suffering and nowadays we have more and more of it near and far. All three of us would've liked to raise people's attention to this issue. I truly believe that through music we can make the world a better place"
Boggie says she is absolutely happy with her song as it is, and her desire is to keep this simplicity and puritanism and just focus on the message. "My song is really modest and minimal, that's how the message can be clearly communicated. I really like this minimalism in my song. A lot of people like this simplicity and can easily connect with "Wars for Nothing" and I feel so blessed to sing it in May". Singer says that this time it was decided not to do a conventional music video. "To avoid clichés I prefer to use my Flashmob video as a videoclip. It speaks for itself. I felt all the power of music and the presence of God. After Eurovision I'm going to make videoclips from my second album "All Is One Is All". "Wars for Nothing is the only ballad on my album. The other songs are a great mixture of everything that I have been influenced by: jazz, pop, country, French chanson...I sing in French, in English and in Hungarian as well. Don't forget to check it out on iTunes. I was deeply inspired by a Japanese anime, Full Metal Alchemist. This is the most successful anime ever. "All is One is All" is the main title of my album. There is an episode in FMA called "All is One, One is All". There are two main characters, 2 little boys. In this episode they have to figure it out what "Everything" and "One" exactly means. This is spiritual and also an action anime series. It's really interesting philosophically. It had a true influence on me"
After success of Budapest flashmob, when Boggie invited her Facebook followers to sing along with her in front of St. Stephen's Basilica in Budapest, Boggie would like to repeat flashmobs on several international locations of her tour. She will try to do it with Eurovision fans in Amsterdam in April and hopes to add more locations to the flashmob tour in the following two months. "I think every occasion is a good opportunity to meet and talk to each other, to exchange ideas", she says. Boggie is also looking forward meeting other Eurovision contestants and says that she has already listened to some of the other participating entries: "I really like the Belgian song. It's really cool". There are also some plans to record the song in other languages, but nothing has been set yet. Singer says they are looking for the perfect lyrics in other languages: "If we could write such good quality lyrics as the English version has, then we would definitely make it public". Besides rehearsals of the stage presentation of her entry, Boggie has a busy schedule in Hungary with ESC and non-ESC related appearances. "This is a really busy time for me. Let it be! I'm going to try to stay focused in the upcoming months", says the singer. At the "A Dal" stage Boggie was joined by gutarist Olivér Lee, who plays in her band and was Boggie's classmate in the Pop Music Conservatory in Budapest. Unfortunately, due to other professional commitments that include release of his solo album, he will not be able to travel to Vienna, and will be replaced by other guitarist. Boggie's choir is made of 4 singers, who are well known as solo artists: Krisztina Szeder-Szabó, Orsolya Sapszon, Milán Szakonyi, Domonkos Dely. "I'm so happy that they accepted my invitation to sing together with me about this universal subject". Speaking about her image and style, Boggie explains that she is working with various stylists, but also has several agreements with different fashion stores, e.g. Dagminell. "Most of the time when I give public concerts I wear Hungarian designer clothes: Use unused, Je suis belle, Elysian...These designers are very imaginative, creative and I'm glad to be able to team with up them". You can read complete version of the interview on OGAE Rest of the World Facebook page. In the next stages of her flashmob tour Boggie has visited Stockholm and London. She also made a quick return back to Budapest to perform at two local concerts. In Berlin Boggie went more relaxed and slightly worried only about transportation of their music instruments, which went well. They have easily got to the city center, checked in the hotel, unpacked, changed outfits, headed to the interview with ESC Radio and then to the live music. The group also had a time to do done sightseeing and visits to museums. There were few technical problems with setting the equipment for the flashmob, but fortunately rechargeable speaker which doesn't require electricity was found in time. There was a nice group gathered to listen to Boggie singing, a lot of people were approaching her in English and German. "I saw beautiful and lovely faces around me, it was so nice, I could do it all day long". The workers from Embassy of Hungary have arrived to flashmob as well, and help her to move the soundsystem back to the other corner of the city. Next time it was Stockholm and ABBA Museum awaiting for her. 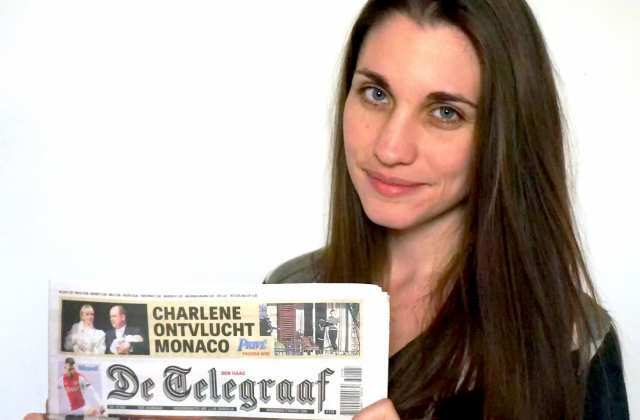 On her Facebook blog in Hungarian Boggie explained that there were some issues with her trip to Amsterdam starting from the beginning - her cameraman Peti ticket was wrong and he had to travel separately. The arrival was followed by some hotel issues, and that was helped to solve by Sarah, songwriter of Wars For Nothing living in The Netherlands, who was able to find a place in Amsterdam for members of Boggie team, guitarist and backing vocalist Milán and Peti. The problems were not finished yet, as the group left on tram a small camera bag and a wallet full of documents and money. Catching the train on a cab didn't work out, and nothing was discovered on train when it reached the terminus. There was a need to report to Police and to inform the Hungarian embassy. That also required a lot of work to locate and to get necessary documents. The day was completely depressing, but in the end it appeared that the bag actually was found by someone and delivered to the hotel. The day ended well with travel to Hague, the embassy reception and the whole team laughing out after a day of bad luck. The delegation discovered that it is actually not allowed to use sound systems on streets in the Netherlands, but fortunately nobody reported the flashmob to police and all went well. There was a group of fans who read the announcements on Facebook and various website that came to sing together with Boggie. So at this very moment she says, every bad feeling fly away and she was totally happy again, as flashmob is the sense of the whole journey. They sang the song all together. "I saw touched and happy faces, we embraced each other in love. It was the single most precious moment of the whole weekend". Then came time for the press-conference and various interviews, where Boggie could test a lot her English skills and those lessons she had in the days before were very useful. Boggie found the most of the Eurovision interviews however, a bit "superficial" and says that some of the reporters interviewing her were not caring enough of her and her entry. The interview session was followed by soundcheck and the concert in a venue packed by people. Boggie was getting feeling that the audience is slightly drunk and wondered if she will be able to impress them with her intimate ballad? She thinks that she ultimately succeeded but feels the "concert" was not really a "concert" but rather a disco and party, yet the audience seemed to enjoy the show. Finally after the show it was time to relax and think about upcoming flashmobs. At this moment the only interview with Boggie published from the Amsterdam party is by ESCKAZ and is available in the interview section above. 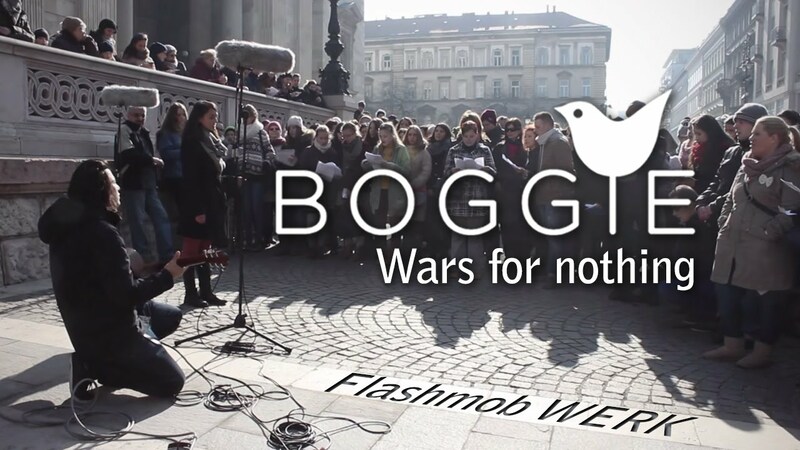 Before the Hungarian national final Boggie gained a lot of attention by inviting people to do a flashmob on one of Budapest's most beautiful squares, in front of the St Stephen's Basilica. In February, hundreds of participants joined Boggie and her band to sing her song together. Driven by her flashmob's success in Budapest, Boggie came up with the idea to bring this experience to other big cities of Europe and she has invited everyone to join in. Between 17 April and 5 May she will visit Amsterdam, London, Berlin, Paris, Rome, and of course Vienna, in the hope that as many followers as possible will sing Wars For Nothing together with her. "It is a very exciting mission and of course great fun to play music on the most beautiful squares of Europe together with my friend Milán Szakonyi who will also stand on stage with me in Vienna. Nevertheless, this action also has a deeper meaning. While I sing this song, I sing it for and in the name of many of us. To perform it together with strangers and the fact that people are willing to become part of it, is a great symbol of the need for unity and of course for the power of music. I cannot wait to stand on the Eurovision stage in Vienna but until then I want to spread my song and its message as far as I can"
Boggie starts her flashmob tour with an event in Amsterdam: everyone is welcome to join her on the Museumplein (in front of the “I Amsterdam” sign) at 10:00 AM on Saturday, 18 April. Boggie will also perform that night at Eurovision in Concert. While being in Hungarian capital Budapest with a promotional visit, representative of Azerbaijan Elnur Huseynov has met beautiful singer Boggie, Hungarian entrant for Eurovision 2015, for a city stroll. Singer Boggie has published her comment on the media speculation about the texts used as part of the background visual design of staging of her entry at the national preselection. 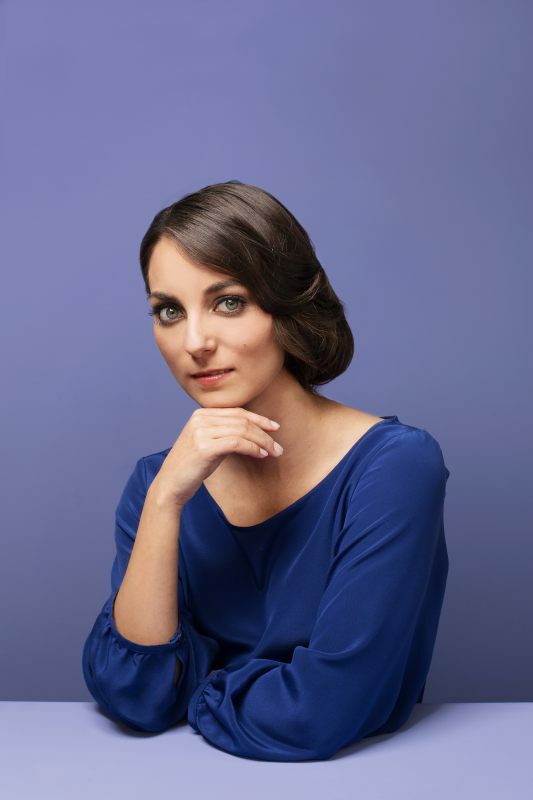 Numerous media outlets, including leading Russian media (NTV, MK, Lenta), without verifying the information have published materials claiming that: "Israel has demanded to edit the song of the Hungarian representative at Eurovision 2015 Boglárka Csemer "Boggie", in which she is criticizing Israel for it's actions in the Gaza Strip. The song "Wars For Nothing" of Hungarian singer criticized Israel's war against Hamas that took place last summer and talked about Palestinian children killed in the conflict". The unverified publications has started spreading in social networks. In fact, the disputed text, the phrase "2014 - Gaza - two-thirds of the victims were civilians, including more than 500 children" is not part of the song, and was used only on the background video screen at the national selection, among other examples of victims of "wars for nothing". Singer reiterated that any call to change this backdrop is already outdated, because immediately after the national selection, it was decided to abandon it, and not on political reasons, but due to a more prosaic explanation - it was distracting attention from the actual performers of the song too much. Even as the official preview video has been submitted the "Flashmob" video, and not the national performance one. See the English language version of the statement below Hungarian. Boggie's Eurovision entry got some unexpected coverage in The Netherlands, thanks to fact that it's lyricist Bori Sára Heléne is Dutch/Hungarian residing in The Hague. "Wars for Nothing" has received very positive reviews in the Dutch press, including largest daily newspaper "De Telegraaf". "The song's message is that we need to pay attention to everything that is happening around us. Even if we ourselves are in a lucky life situation, we should think of how much pain and suffering there is in the world", explained songwriter message of the lyrics. Meanwhile, coverage in Israeli media of Hungarian entry has been less positive. The backdrop, used in the national presentation of the entry, was criticized for mentioning child victims who suffered in Palestinian Gaza in 2014 - apparently during the Israeli operation "Protective Edge". A senior official in the Hungarian broadcasting authority stressed in a conversation with Israeli Ambassador Ilan Mor that the Eurovision rules don't allow political messages during the competition, and promised that the statement about Operation Protective Edge would not be included in the Eurovision performance of the song. It is planned not to use any background texts in the performance of Hungarian entrant as well. Among other victims of wars, the backdrop mentioned "13 Ukrainian soldiers dead in 24 hours" on February 1, referring to the Donbass war. For the 4th time Hungarian broadcaster MTVA will use "A Dal" format to select it's entry for the Eurovision Song Contest 2015. The competition consists of 6 shows presented by Csilla Tatár with Levente Harsányi reporting from the backstage. Submission period for the show run from 1 October to 15 November 2014. Competing artists were required to either hold Hungarian citizenship or be able to speak Hungarian fluently. In addition, only artists that had a contract with a record label or a professional management and that had earlier released an album, or had national radio airplays or television appearances were eligible to compete. Artists were allowed to collaborate with international composers and submit songs in English and/or one of 13 recognized minority languages of Hungary (including Armenian, Russian, Ukrainian etc) providing written translation of lyrics into Hungarian. Over 300 entries were received by the broadcaster. A 10-member preselection jury, made of Pierrot, Jenő Csiszár, Magdi Rúzsa, Philip Rákay, Kata Nyitrai, Fecó Balázs, Attila Horváth, György Koós, Attila Izil Borcsik and Mátyás Milkovics, selected 30 of them for the competition. Competing artists were revealed in 3 parts: during a press conference on 8 December 2014 and on 10 and 12 December 2014 during broadcasts on MR2 Petőfi Radio. Among the competing artists are former Eurovision Song Contest entrants Kati Wolf (ESC 2011) and Gergő Rácz (competing as a member of Fool Moon) who previously represented Hungary in the ESC 1997 as part of the group V.I.P. Read more about the participating artists here (in Hungarian). The competing entries have been published in full length on 13 January 2015. Three heats (or quaterfinals), have been held on 24 January, 31 January and 7 February 2015, consisting of 10 songs each. The qualifying entries were determined by two rounds of voting; in the first round, the top 5 entries are determined by the combination of the votes from each of 4 judges and an average score from a public voting via mobile voting app (Android, iOS) while the remaining entries face new SMS and mobile app vote to determine one additional qualifier. The semi-finals on 14 and 21 February 2015 will each feature nine competing songs each. The final is set for 28 February 2015. Main shows will be broadcasted on M1 and DUNA World (online) at 20.25 CET. After-show "A Dal +", hosted by Levente Harsányi, is aired on M2 for 26 minutes right after each of the main "A Dal" shows. 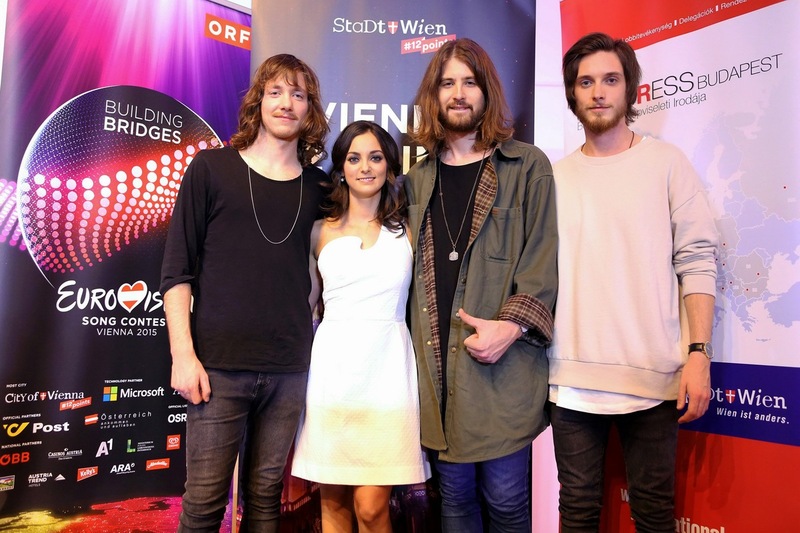 As last year there will be additional online vote (on Facebook page) for the best acoustic version of the participating entry, which will have no influence on the official result - the winner is band Leander Rising. This year Duna TV will broadcast the Eurovision Song Contest shows in May on behalf of Magyar Television MTVA. From 15 March M1 will become a news channel, thus entertainment shows will be moved to Duna TV. In the final jury will reveal their scores after the last performance, using a different system, voting for top 6 acts on 2-12 base. The viewers will then select winner among the 4 highest rated productions of jury. Богларка Чемер "Boggie" родилась 30 ноября 1986 года в Будапеште. Богги начала свои музыкальные занятия в возрасте 13 лет. Два года спустя, она приступила к изучению классического вокала и фортепиано в музыкальной школе Fasang Árpád Zeneiskola. Занимаясь там до 2007 года, параллельно, с 2004 года она также учится в Школе искусств им. Ференца Эркеля и Джазовой Музыкальной Школе. В 2005-2006 годах она проводит год в Париже, где ближе знакомится с французским языком и культурой, а в 2006-2007 году она получает специализацию в качестве франкоязычного туристического гида. 2007 году она начинает заниматься в музыкальной студии Kőbányai и параллельно в колледже имени Шарля Эстерхази, также по специальности "романистика". В 2009 году Богги основывает свою музыкальную группу "Csemer Boglárka Quartet". В 2011 году она принимает участие в программе "Csillag Születik" - венгерской версии программы "Минута славы", выходящей на телеканале RTL Klub, где выступает вместе с пианистом Аароном Себастьяном. Выбыв на стадии полуфинала, Богги все равно приобретает множество новых поклонников. Песня "Japánkert" Богги и Аарона завоевывает специальный приз Венгерской Джазовой Ассоциации. В 2012 году Квартет Богги выступает на Джазовом шоу во Дворце Искусств. В 2012 и 2013 году Богги принимает участие в Национальном конкурсе шансона в качестве члена жюри. В 2014 году она также поет в составе французской группы Accordzeam. В 2012 году Богларка начинает работать над своим первым релизом. Вместо использовавшегося ранее CSBQ (Csemer Boglárka Quartet) ее группа начинает выступать под коротким именем Boggie. Помимо самой Богларки в настоящее время в состав группы входят: Аарон Себастьян - клавишные, Михал Шимко-Варнагь - электро-виолончель, бас, Тамаш Сабо - ударные. Ее дебютный альбом выпускается в 2013 лейблом Tom-Tom Records. Он включает в себя песни на венгерском, французском и английском языках, половину из которых написала сама певица. Альбом достигает четвертой строки в чарте Mahasz. "Моя музыка - это смесь всех стилей, которым я училась: поп-музыки, джаза, французского шансона, кантри, фолка и классической музыки. Я называю свой стиль высококачественной поп-музыкой. Я думаю, что для меня было важным начинать писать собственные песни, это оттачивает характер и помогает найти собственный голос. А после этого приходит время, когда ты можешь дать ответ, стоило ли затевать все это. Мое полное имя - Богларка, не имеет эквивалента ни в одном другом языке. Потому я решила на сцене выступать под псевдонимом BOGGIE"
В январе 2014 года видеоклип Богги на песню "Nouveau Parfum" (французская версия песни "Parfüm", которая заявлялась для участия в венгерском отборе на Евровидение "A Dal" в 2012 году, но не была выбрана в состав его участников) был подхвачен крупнейшими мировыми СМИ, включая немецкий телеканал RTL, шоу Доброе Утро Америка, французский журнал Elle, Cosmopolitan, журнал Time и газету Daily Mail. Видео и его месседж напоминают вирусное видео "Эволюция тела", созданное для GlobalDemocracy.com, призывающее к использованию обязательных сносок при использовании в СМИ изображений с компьютерным ретушированием. Всего видео Богги было просмотрено свыше 30 миллионов раз, а ее дебютный альбом взлетел на 3ю строчку джазового чарта Billboard и 17го места в чарте мировой музыки Billboard. После такого успеха, в 2014 году певица дает свыше 100 концертов. Богги также выступает за пределами Венгрии: на фестивале Jazz Sur Seine в Париже, и нескольких шоу в Нью-Йорке, Франкфурте, Мюнхене и Нидерландах. 24го октября 2014 года Богги выпускает свой второй альбом "All Is One Is All", на который вошла и ее конкурсная песня "Wars for Nothing". 2015 год тоже удачно начался для певицы: она была номинирована на звание Glamour Woman of the Year, в видеоклип на сингл Noveau Parfum попал в число 17 номинантов премии Событие года в Венгрии. "Когда мы с Аароном Себастьяном записывали альбом, мне хотелось, чтобы в него вошла красивая баллада. Меня очень тронула и расстроила ситуация, складывающаяся в Украине. Я хотела бы написать песню о ней, как и вообще обо всех "войнах из-за ничего" во всем мире. Но к тому моменту, как я пошла со своей идеей к Аарону, он уже подготовил для меня песню на ту же самую тематику. Я очень часто задумываюсь о современном мире, и происходящее в нем меня очень сильно угнетает. Везде в мире происходят войны, но Украина находится так близко от Венгрии, у меня даже живут там родственники, потому я задумалась, "Ведь так может произойти и с нами. Что нам нужно делать, чтобы избежать этого?". Я читала газеты и старалась следить за новостями. Потом я вдруг столкнулась в лифте с беженцем с Украины и для меня это тоже стало настоящим шоком. Когда война происходит недалеко от вас, она имеет большее влияние на ваши чувства. Однако, сама по себе песня не говорит только о войне в Украине, а скорее о дискриминации, подавлении и войнах в целом. Я хочу передать ее месседж всем слушателям"
Следующий гость интервью-сессий ESCKAZ - представительница Венгрии Богларка Чемер "Boggie", которая представляет на Евровидении не просто песню, но и важный месседж. Как обычно, мы начали с вопроса о том, что участие в Евровидении значит для исполнительницы? "Я очень рада, и чувствую себя абсолютно счастливой. Я так горжусь результатом, показанным на национальном отборе. И с нетерпением жду поездки в Вену! :-) Евровидение - это самая подходящая сцена для того, чтобы донести свою музыку как можно большему количеству людей. Мне очень нравится сама идея Евровидения. Я думаю, что это отличная возможность для встречи людей с разных культур, разных народов, и познакомиться поближе с культурой друг друга"
"На самом деле моя песня была написана для моего второго альбома "All is One is All", который был выпущен в октябре 2014 года, а не специально для Евровидения. Мы лишь выбрали для конкурса "Wars For Nothing" из числа других доступных песен. Мне хотелось выступить на конкурсе с песней на английском языке и несущей важный месседж. Она была создана тремя композиторами: Аароном Себастьяном, Сарой Хеленой Бори и мной самой. Каждый из нас руководствовался своим поводом, различными историями из современного мира. Меня, например, очень трогают любые человеческие страдания, а сегодня мы слышим о них отовсюду, из далеких и близких стран. Мы втроем хотели привлечь внимание людей к данному вопросу. Я действительно верю в то, что с помощью музыки мы все можем сделать наш мир хотя бы немного лучше." Богги говорит, что абсолютно довольна своей песней в том виде, как она существует сегодня, и ее желание состоит в том, чтобы сохранить простоту и даже некий пуританизм, и сфокусироваться на смысле и посыле текста. "Моя песня очень скромная и минималистичная, только в этом случае можно четко передать ее месседж. Этот минимализм в песне мне очень нравится. Благодаря этой простоте, с ее текстом ассоциировать себя могут многие слушатели, и для меня исполнить ее в мае на весь мир - настоящее благословение". Певица говорит, что на этот раз было решено не снимать к песне обычный видеоклип. "Для того, чтобы избежать клише, мы решили использовать в качестве видеоклипа видео с флешмоба. Оно говорит само за себя. Я почувствовала во время его съемки всю силу музыки и присутствие Бога. После Евровидения я буду снимать несколько видеоклипов на песни с моего второго альбома "All Is One Is All". "Wars for Nothing - это единственная баллада на моем альбоме. Другие песни - это смесь той музыки, которая вдохновляет меня: джаз, поп, кантри, французский шансон... Я пою на нем на французском, английском и венгерском. Не забудьте послушать его на iTunes. Меня очень сильно вдохновило японское аниме "Full Metal Alchemist". Это самое успешное аниме в истории. Заголовок моего альбома - "All is One is All". В этом аниме есть эпизод, который носит название "All is One, One is All". В нем два главных героя, два маленьких мальчика. В этом эпизоде они пытаются выяснить, что на самом деле означают слова "Всё" и "Один". Это очень духовное аниме, но с элементами экшена. Оно очень интересно для меня в философском плане. На меня оно очень сильно повлияло"
После успеха будапештского флешмоба, когда Богги призвала своих подписчиков в Facebook прийти на площадь перед Базиликой Св. Стефана в Будапеште и поддержать ее пение, Богги хочет повторить аналогичные флешмобы в некоторых других Европейских странах в рамках своего тура. Она попробует сделать это с поклонниками Евровидения в апреле в Амстердаме и надеется, что в ее флешмоб-тур в ближайшие два месяца добавятся и другие города. "Мне кажется, что каждая подобная возможность - это шанс встретиться с другими людьми, обменяться с ними идеями", говорит певица. Богги также с нетерпением ждет встречи и с другими участниками конкурса и уже прослушала большинство их песен: "Мне очень нравится песня Бельгии. Она реально классная". Есть некоторые планы записать конкурсную песню Богги на других языках, но пока это не решено окончательно. Певица говорит, что ищет идеальные тексты на других языках. "Если бы мы смогли написать настолько же качественный текст, как у английской версии, то несомненно бы записали новый вариант". Помимо репетиций сценической постановки своего номера, у певицы в настоящее время довольно напряженный график в Венгрии, который включает в себя как выступления связанные, так и не связанные с Евровидением. "Это очень занятое время для меня. Но пусть будет так! Я попытаюсь оставаться сфокусированной на протяжении всех предстоящих месяцев", говорит певица. На сцене национального отбора "A Dal" с Богги выступал гитарист Оливер Ли, который также играет в ее группе и был однокурсником Богги в Эстрадной Консерватории в Будапеште. К сожалению, из-за других профессиональных обязательств, в частности выхода его первого сольного альбома, он не сможет отправиться в Вену, и на сцене его заменит другой гитарист. В хор Богги входят 4 исполнителя, которые достаточно известны в Венгрии как сольные артисты: Кристина Седер-Сабо, Оршолия Шапсон, Милан Саконьи, Домонкош Дели. "Я очень рада тому, что они приняли приглашение выступить вместе со мной с песней на эту глобальную тематику". Говоря о своем имидже и стиле, Богги объясняет, что она работает со многими стилистами, но имеет договоренности и с различными модными магазинами, например Dagminell. "Большую часть времени, когда я даю концерты, то я выступаю в костюмах от венгерских брендов: Use unused, Je suis belle, Elysian... Эти дизайнеры одарены богатым воображением, креативны, и я рада сотрудничеству с ними". С полной версией интервью (на английском языке) вы можете познакомиться на странице ОГАЕ Остальной мир в Facebook. В продолжение своего флешмоб тура Богги посетила Стокгольм и Лондон. Она также вернулась на несколько дней в Будапешт, чтобы выступить там на двух местных концертах. В поездке в Берлин Богги была уже более расслаблена и волновалась только за перевозку музыкальных инструментов, что прошло без проблем. Команда с легкостью достгла центра города, заселилась в отель, распаковалась, переодела костюмы, дала интервью ESC Radio и отправилась играть живую музыку. Также у них было время сходить на экскурсию и посетить несколько музеев. Было несколько технических проблем с аппаратурой для флэшмоба, но в итоге удалось найти подзаряжаемые колонки, которым не требуется электричество. Послушать Богги собралась довольно большая группа людей, многие обращались к ней на английском и немецком. "Я видела красивые и дружелюбные лица вокруг меня, было так мило, я могла бы петь так целый день". На флешмоб пришли также работники посольства Венгрии, которые помогли потом отвезти аппаратуру обратно на другой конец города. Дальше Богги ждал Стокгольм и Музей АББА. В своем Facebook блоге на венгерском языке Богги объясняет то, что ее поездка в Амстердам была проблемной с самого начала. Оказалось, что у оператора Пети был неправильно выдан билет и ему пришлось добираться отдельно. По прибытию, делегация столкнулась с проблемами в отеле, которые были разрешены только при помощи Сары - соавтора песни, живущей в Нидерландах, которая смогла устроить часть команды Богги - гитариста и бэк-вокалиста Милана и оператора Пети у своих друзей в Амстердаме. На этом проблемы не закончились, группа пропустила свою остановку, а выбегая из трамвая забыла в нем сумку с видеокамерой и кошельком, полным документов и денег. Попытка догнать трамвай на такси ничего не дала, его удалось поймать только в трамвайном парке, но внутри его уже ничего обнаружено не было. Было нужным сообщить информацию полиции и посольству. Пришлось провести множество работы, чтобы найти полицейский участок и получить необходимые документы, без которых бы не удалось вылететь обратно в Венгрию. День складывался совершенно депрессивно, но в конце оказалось, что сумку все-таки кто-то нашел и доставил в отель. Завершила день поездка в Гаагу, прием в посольстве, где команда смогла наконец расслабиться и посмеяться дню неудач. Делегация обнаружила, что оказывается, в Нидерландах запрещено использовать на улицах звуковые системы, но, к счастью, никто не доложил о проведении флешмоба полиции, и все прошло очень удачно. К месту проведения пришла группа поклонников, которые прочитали рекламу в Facebook и различных вебсайтах и пришли спеть вместе с Богги. Именно в этот момент, пишет она, все плохие чувства окончательно улетучились, и она была снова совершенно счастлива, ведь флешмоб был центром всей поездки. Все присутствующие вместе от начала и до конца спели песню Богги. "Я увидела счастливые и тронутые лица, мы окружили друг друга любовью. Это был самый ценный момент всей поездки". Затем пришло время для пресс-конференции и интервью, где Богги смогла отрепетировать свое знание английского и те уроки, которые она брала перед поездкой оказались ей весьма полезны. Правда Богги показалось, что большая часть интервью сайтам Евровидения была слишком "поверхностной" и репортеры не всегда достаточно интересовались ею самой или ее песней. За интервью сессией последовал саундчек и концерт в переполненном зале. К Богги подкралось ощущение, что зрительская аудитория уже слегка нетрезва, и она задала себе вопрос, смогу ли я впечатлить их своей интимной балладой? Она думает, что в конце-концов ей это все-таки удалось, но по ее мнению "Концерт" был не сколько "концертом", сколько дискотекой и вечеринкой, хотя зрители и получили от всего шоу большое удовольствие. Наконец, после шоу удалось расслабиться и пришло время подумать о других предстоящих флешмобах. На данный момент у Богги опубликовано только одно интервью с вечеринки Амстердама - это интервью ESCKAZ, которое вы можете увидеть в интервью разделе выше. Перед национальным венгерским финалом певица Богги привлекла к себе большое внимание, пригласив своих поклонников принять участие во флешмобе на одной из самых красивейших площадей Будапешта, перед базиликой св.Стефана. В феврале сотни людей присоединились к Богги и ее группе, чтобы вместе с ней спеть ее песню. После такого успеха флешмоба в Будапеште, к Богги пришла идея проведения аналогичного флешмоба в других крупных городах Европы, и она приглашает всех присоединиться к ней. Между 17 апреля и 5 мая она посетит Амстердам, Лондон, Берлин, Париж, Рим и Вену, где надеется собрать как можно большее количество последователей, которые исполнят с ней песню Wars For Nothing. "Это очень захватывающая миссия, и в то же время огромное удовольствие, выступить на самых красивейших площадях Европы со своим другом Миланом Саконьи, который также выйдет со мной на сцену в Вене. Однако, у этой акции есть и более глубокое значение. Когда я пою свою песню, я пою ее для и во имя многих из нас. Исполнение ее с незнакомыми мне людьми, которые в то же время желают к ней присоединиться - прекрасный символ необходимости единства и, конечно же, силы музыки. Я не могу дождаться того момента, когда я выйду на сцену Евровидения в Вене, но пока я хотела бы распространить свою песню и ее месседж так широко, как это только возможно"
Богги начнет свой флеш-моб тур выступлением в Амстердаме. Все желающие приглашаются присоединиться к ней на Museumplein (перед знаком "I Amsterdam") в 10 утра в субботу 18го апреля. Тем же вечером венгерская певица выступит и на шоу Eurovision In Concert. Во время своего пребывания в столице Венгрии Будапеште представитель Азербайджана Эльнур Гусейнов встретился с представительницей Венгрии на конкурсе этого года Богги на городской прогулке. Певица Богги опубликовала свой комментарий по поводу спекуляций прессы о текстах, использованных в качестве визуального оформления ее номера на национальном отборе. Многочисленные СМИ, в том числе и российские (НТВ, МК, Лента), не проверив информацию, выдали материалы следующего содержания: "Израиль потребовал отредактировать песню венгерской участницы "Евровидения" Богларки Чемер (Богги), в которой она критикует израильтян за действия в сектора Газа. В песне Wars For Nothing ("Войны из-за ничего") венгерская исполнительница подвергла критике войну Израиля с движением ХАМАС летом прошлого года, а также рассказала о палестинских детях, погибших в ходе конфликта". Вслед за ними непроверенная публикация стала распространяться и в социальных сетях. На самом же деле, спорный фрагмент: фраза "2014 год - Газа - две трети жертв были гражданские лица, включая свыше 500 детей" не является составной частью песни, а была использована только в иллюстрирующем видео на заднем экране номера на национальном отборе, среди других примеров жертв "Wars for Nothing". Певица вновь подчеркнула, что любые призывы изменить данный задник уже давно устарели, поскольку, сразу же после национального отбора было решено отказаться от него, и не по политическим, а по более прозаическим мотивам - он слишком отвлекал внимание от собственно исполнителей песни. Напомним, что в качестве превью видео было заявлено также не видео с национального отбора, а видео с флешмоба. "Интернет СМИ пишут о после Израиля в Венгрии, призвавшем телеканал MTVA удалить предложение о жертвах войны в Газе из визуального оформления номера моей песни. Хотя я всячески старалась избегать каких-либо комментарий по поводу дебатов, к которым я сама имею только опосредованное отношение, у меня не остается другого выбора, поскольку все это имеет влияние на мою песню для Евровидения 2015. Мне нравится песня "Wars for Nothing". Я действительно горжусь ею. Я твердо верю в силу моей песни, и что мир нуждается в таких песнях. Потому, мне становится невероятно печально, что кто-то интерпретирует песню, написанную о и ради мира, как попытку атаки на любой из народов. В песне говорится не только о мире, но и о нашей внутренней борьбе и нашей способности противостоять нашим ошибкам и взять на себя ответственность за свои действия. По отзывам, появившимся уже после полуфинала национального отбора в Венгрии, текст на заднем фоне номера отвлекал внимание от исполнителей, но, к сожалению, перед финалом конкурса оформление номера нам не удалось успеть изменить. Новый фон будет основываться на анимации, а не словах. Коллаж-мудборд для нового фонового видео был подготовлен и передан организаторам конкурса в Вене 15 марта во время заседания глав делегаций Евровидения 2015. Это произошло еще две недели назад, задолго до того, как прозвучали какие-либо возражения против предыдущего варианта видео. Таким образом, нет никакой необходимости призывать телеканал MTVA принимать какие-либо дальнейшие шаги. Я хотела бы надеяться, что в 21-м веке существует художественная свобода. Всю свою жизнь я пою для того, чтобы сделать наш мир лучше, вне зависимости от чьего-либо мировоззрения или национальности, и я буду продолжать это делать в будущем"
Конкурсная песня Богги, неожиданно попала во внимание голландской прессы, благодаря тому, что автор ее текста Бори Сара Хелене имеет смешанную венгерскую и голландскую кровь и в настоящее время проживает в Гааге. Обзоры песни "Wars For Nothing" в голландской прессе, включая крупнейшую ежедневную газету "De Telegraaf" были весьма позитивными. "Посыл песни состоит в том, что нужно обращать внимание на все, что происходит вокруг нас. Даже если нам самим повезло, и мы живем в мире и спокойствии, нужно думать о том, сколько еще в мире существует боли и страданий", объяснила автор смысл текста песни. Тем временем, освещение песни в израильской прессе было не столь позитивным. Она подтвергла критике экраны, использовавшиеся во время национальной презентации песни, на которых, помимо прочего, упоминались дети-жертвы, погибшие в палестинской Газе в 2014 году - по всей видимости во время израильской операции "Нерушимая скала". Представитель Венгерского телевидения, в свою очередь, отметил в разговоре с послом Израиля Иланом Мором, о том, что правила Евровидения не допускают использования политических подтекстов во время конкурса, и пообещал, что данная фраза не будет использоваться во время конкурсной презентации песни. Планируется отказаться от использования бэкграундных текстов вообще. Среди других жертв войн, упомянутых на экране в номере Богги, были отмечены также "13 украинских солдат, погибшие за 24 часа" 1го февраля во время боевых действий на Донбассе. В четвертый раз венгерский национальный вещатель MTVA будет использовать шоу "A Dal" для отбора своего представителя на конкурс Евровидение 2015. Национальный отбор состоит из шести шоу, ведущей которых станет Чилла Татар, а Левенте Харшаньи будет брать у артистов интервью из гринрума. Прием заявок на участие в шоу продлился с 1го октября по 15 ноября 2014 года. Участвующие артисы должны были либо являться гражданами Венгрии, либо в совершенстве владеть венгерскми языком. Помимо того, к участию допускались только артисты, имеющие действующий контракт с звукозаписывающей компанией или профессиональным менеджментом, и либо выпустивший ранее альбом, или имевший песни выходившие на национальном радио или телевидении. Артисты могли сотрудничать с зарубежными композиторами. Допускалось и участие с песнями на английском языке, или официальных языках национальных меньшинств Венгрии, при условии подачи в заявке также венгерского текста композиции. Всего вещателем было получено свыше 300 заявок. Профессиональное жюри из 10 членов, в которое вошли Пьерро, Йено Чизар, Магди Ружа, Филип Ракой, Ката Нитрай, Феко Балаш, Атилла Хорват, Гьорг Коош, Атилла Изил Борчик и Матиаш Милкович выбрали 30 из них для участия в отборе. Полуфиналисты были представлены тремя частями: во время пресс-конференции 8го декабря, а также 10 и 12 декабря во время радиоэфиров на станции MR2 Petőfi Radio. Среди конкурсантов отбора: Кати Вольф, представлявшая Венгрию на Евровидении 2011 и Герго Рачс (в составе группы Fool Moon), ранее выступавший на Евровидении 1997 в составе V.I.P. Подробнее с участвующими артистами вы можете познакомиться здесь (на венгерском языке). Участвующие песни были опубликованы в полной своей длине 13го января 2015 года. Три предварительных тура (или четвертьфинала) пройдут 24го и 31го января и 7го февраля 2015, в каждом из них выступят по 10 песен. Те из них, которые выйдут в следующий раунд будут определны в два раунда голосования: в первом раунде лучшие 5 песен будут определны суммированием голосования 4х членов жюри и общего балла из голосования зрителей в реальном времени посредством мобильного приложения (Android, iOS). Среди оставшихся 5 песен будет проведено новое СМС и мобильное голосование, которое определит еще одного полуфиналиста. Полуфиналы состоятся 14го и 21го февраля, в каждом из них примут участие по 9 песен-кандидатов. Финал назначен на 28 февраля. Основные шоу будут транслироваться на телеканалах M1 и DUNA World (онлайн) в 22.25 Москвы. После окончания основного шоу, на телеканале M2 в эфир будет выходить дополнительное после-шоу "A Dal +", которое проведет Левенте Харшаньи. Как и в прошлом году на Facebook странице будет проводиться дополнительное онлайн голосование по акустическим версиям песен участников, не влияющее на основной результат - победу одержала группа Leander Rising. В этом году шоу международного финала Евровидения в мае от имени Венгерского телевидения MTVA будет транслировать телеканал Duna TV. С 15го марта телеканал M1, ранее транслировавший конкурс, становится круглосуточным новостным каналом, таким образом все развлекательные шоу с него сдвинутся на Duna TV. В финал жюри проголосует после завершения всех выступлений, используя новую систему: называя лучшую 6ку и давая ей баллы от 2 до 12. В финальном раунде телезрители выберут победителя среди 4х песен, лучше всего оцененных жюри. Все души, все души, слышишь как они плачут? Беспомощной душе, разбивать сердце, убивать ум.